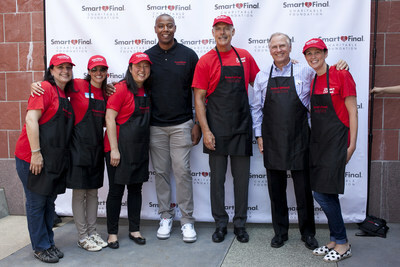 COMMERCE, Calif., Aug. 10, 2017 /PRNewswire/ -- The Smart & Final Charitable Foundation – a philanthropic arm of Smart & Final Stores, Inc. (NYSE: SFS) – today hosted a summer-inspired ice cream social for the pediatric patients and families of Children's Hospital Los Angeles (CHLA), the region's leading pediatric hospital and academic research center. The purpose of the ice cream social was to bring the joy of summer directly to patients receiving treatment at CHLA. During the event, CHLA patients, families and medical staff were treated to a stocked ice cream bar with Nestle and First Street®, as well as farm-fresh produce and family-friendly activities. Celebrated athlete Caron Butler was also onsite to visit with patients, help pass out ice cream treats, take pictures and sign autographs. As a parent himself, Caron has a strong affinity for organizations that safeguard the health and development of children, especially those that serve the greater Los Angeles community. The day also included a ceremonial check presentation made to Children's Hospital Los Angeles from the Smart & Final Charitable Foundation in the amount of $5,000. "Summer is synonymous with picnics, pool parties and vacations, but for far too many children who spend their summer days in a hospital receiving treatment for illnesses, we wanted to bring a taste of summer directly to them," said Marisol Marks, Smart & Final Vice President of Communications, Community Relations and the Smart & Final Charitable Foundation. "Through the combined efforts of the Smart & Final Charitable Foundation, Children's Hospital Los Angeles and many of Smart & Final's loyal vendor partners, we were able to make this seasonal celebration possible for these children." Children's Hospital Los Angeles is dedicated to creating hope and building healthier futures for all children. "All of us at Children's Hospital Los Angeles are devoted to creating the best environment possible for each one of our patients," said Dawn Wilcox, Vice President Corporate Partnerships CHLA. "We're pleased to partner with the Smart & Final Charitable Foundation to create a special, fun day for our patients and their families." Today's ice cream social at CHLA is an example of the many ways the Smart & Final Charitable Foundation support local communities. The Charitable Foundation provides grants to charities and other non-profits across four key areas, including health & wellness, education, hunger relief, and team sports & youth development. Made possible through vendor, employee and executive contributions, the Smart & Final Charitable Foundation also fundraises through the First Street®, First Percent program – with the purchase of any First Street® private label brand products, Smart & Final will contribute the first percent of net profit to the Smart & Final Charitable Foundation to further advance its mission to serve those who serve others. The Company is the single largest contributor of donations to the Smart & Final Charitable Foundation. Established in 2002, the Smart & Final Charitable Foundation is a 501(c)(3) Charitable Organization which strives to give back, improve the quality of life and nourish communities throughout California, Arizona and Nevada. Throughout the years, the foundation has donated millions of dollars to causes and organizations focused on health and wellness, education, hunger relief, and team sports and youth development. The Smart & Final Charitable Foundation raises funds through its corporate sponsor Smart & Final Stores, Inc., as well as through vendor donations and in-store fundraising. Through the First Street®, First Percent program, when Smart & Final customers buy First Street® items, Smart & Final contributes the first percent of net profit to the Smart & Final Charitable Foundation. Children's Hospital Los Angeles has been ranked the top children's hospital in California and sixth in the nation for clinical excellence with its selection to the prestigious U.S. News & World Report Honor Roll. CHLA is home to The Saban Research Institute, one of the largest and most productive pediatric research facilities in the United States. Children's Hospital is also one of America's premier teaching hospitals through its affiliation with the Keck School of Medicine of the University of Southern California since 1932. For more information, visit CHLA.org.